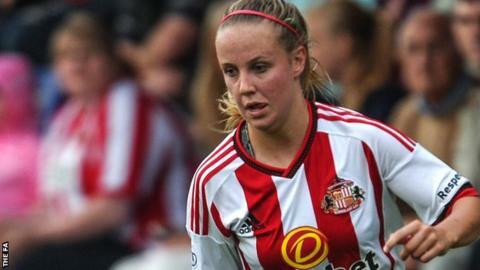 Last season's top scorer Beth Mead opened her 2016 account as Sunderland fought back to deny Reading their first ever Women's Super League One win. Royals keeper Grace Moloney foiled Mead before Lois Roche put Reading ahead with a deflected free-kick. Mead rounded Moloney to level after the break and then had an effort cleared off the line by Kirsty McGee. Sunderland keeper Rachael Laws made a series of saves as Reading earned their first ever point in the top flight. Sunderland Ladies: Laws; Holmes, Bannon, Williams, Sjoman; Furness, Chaplen, Staniforth; Joice (Ramshaw 46), Mead, Johnston (Kelly, 46). Substitutes not used: Gunn Olsen, McDougall, Roche, Beer, Potts. Reading Women: Moloney; Jane, Bartrip, McGee, Rowe; Hines, Roche, Estcourt (Bruton 58); Ward (Jones 90), Boho Sayo, Follis. Substitutes not used: Earps, Cox, Scott, Horwood, Walkley.